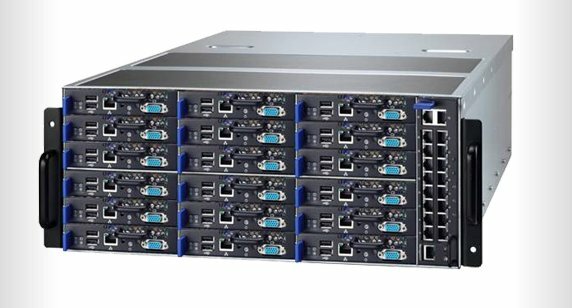 After unveiling their GFX servers based on Marvell ARM Cortex A9 SoC at Computex 2012, Mitac announced their new 7-Star server at Computex 2013. This new server is based on Applied Micro X-Gene SoC featuring ARMv8 architecture, and is one of the first, if not the first, 64-Bit ARM server ever. It will be available by the end of the year. That’s about all I know for now, but more information should eventually come up on Mitac 7-Star page. Nice, how many points matches in antutu? 😀 I am jokering. Great News, its a big step to get a Personal computer based on ARM. It’s a good step in terms of 64-Bit ARM software support, but this particular SoC is only for server applications (in datacenters), it offers 10GbE bandwidth and support for SATA, but there’s no video output at all. I don’t remember announcements about Cortex A57 SoC for laptops/tablets, maybe I overlooked it, or just forgot about it. @cnxsoft Whilst the initial arm-64 stuff is clearly for servers, if they are viable and competitive it is only a matter of time before they go beyond that. AMD finally realising that hitching themselves to the wintel train isn’t a long-term strategy can’t hurt either. It will certainly be interesting to see their take on the ARM-64 cpu’s when they come out. With a certainty – the highly competitive and wide-open environment from all the ARM licensees is only going to benefit the end consumer. No, this is not an A57. Applied Micro have a v8 architecture license. Yep, it seems correct. Applied Micro are doing their own ARMv8 cores, I’ll change that. Thanks.